Today's wedding took place in August this year at a venue that I only visited for the first time a couple of months ago. I was surprised at how beautiful Whirlowbrook Hall was and that I hadn't been there before. I am definitely going to set aside some time to take a walk around the grounds as they looked so beautiful on my drive through. 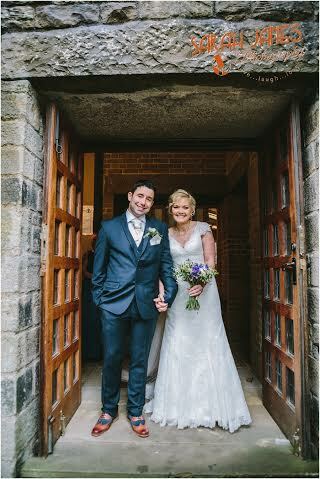 Anyway, enough about me, Claire and Ryan got married at Christchurch in Fulwood with the reception held at Whirlowbrook Hall. 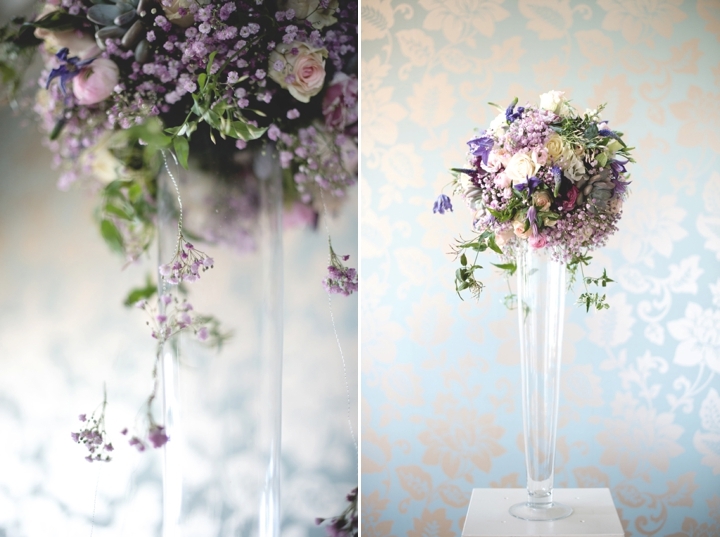 Claire is a massive fan of wild, country and meadowy flowers and wanted a colour pallet of blues, creams and whites. 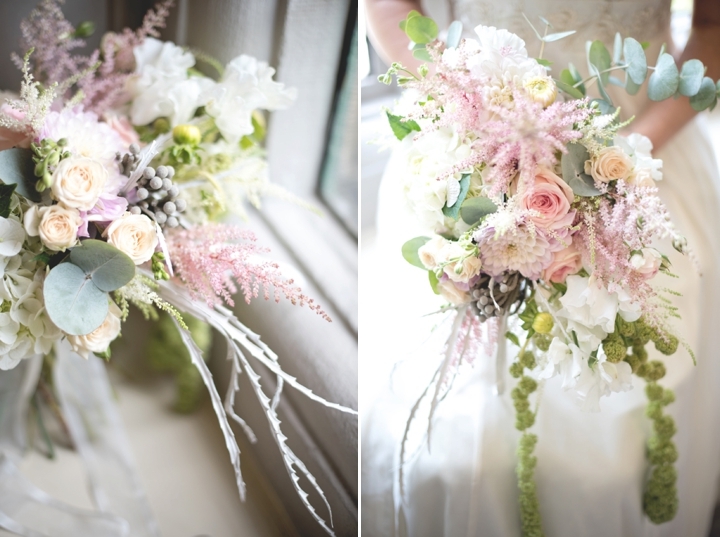 As you can see from the photography that this was kept very much in mind when designing the bouquet. 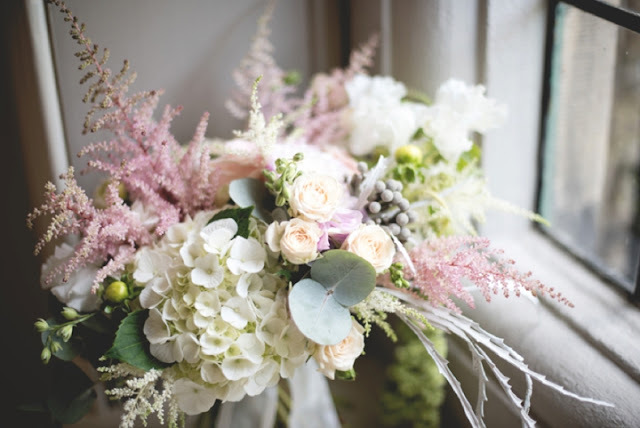 Included in the bouquet were blue delphinium, blue hydrangea, thistles, corn flowers, nigella, cream lisianthus, gypsophila, astilbe, astrantia, echinops, wax flower, eucalyptus, tanacetum and crespedia. For the bridesmaids Claire and Ryan chose to have smaller versions of Claire's bridal bouquet with a greater concentration of cream flowers so the blue really stood out for Claire. Their little flower girl Freya got to carry one of my favourite accessories, a wand!!!! 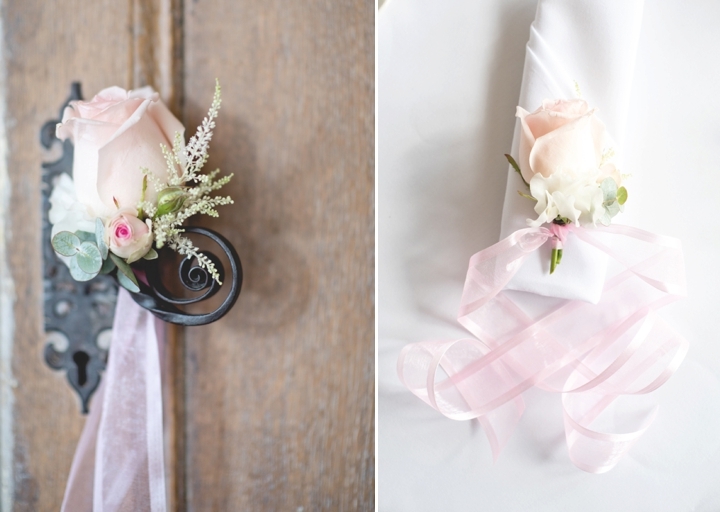 I just love them as an alternative to bouquets for little girls. 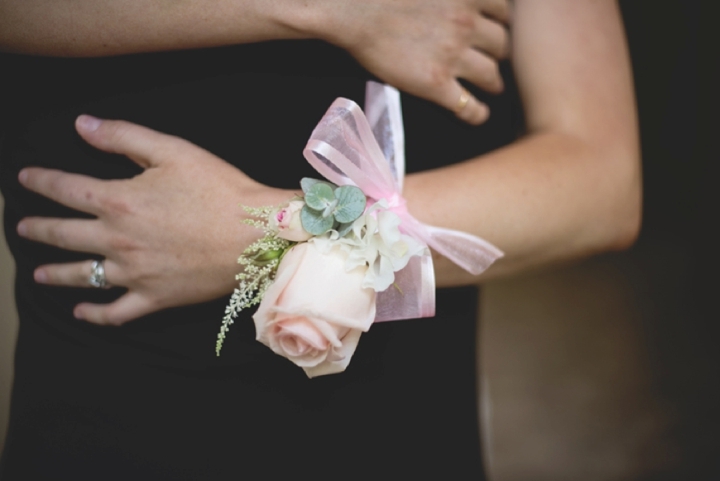 The men had sprig style buttonholes based around a blue thistle with cream flowers but using more blue in Toby's. The ladies went for a sprig style too but with a selection of more softer and feminine flowers. 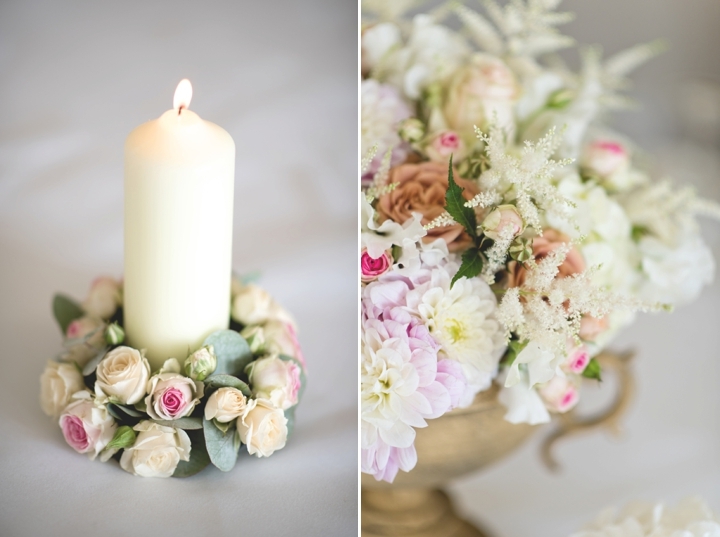 A massive thanks to Sarah Janes Photography for letting us use these gorgeous images, they are just beautiful. 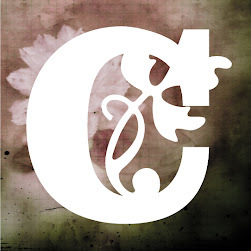 Just follow the link to see more of her work. 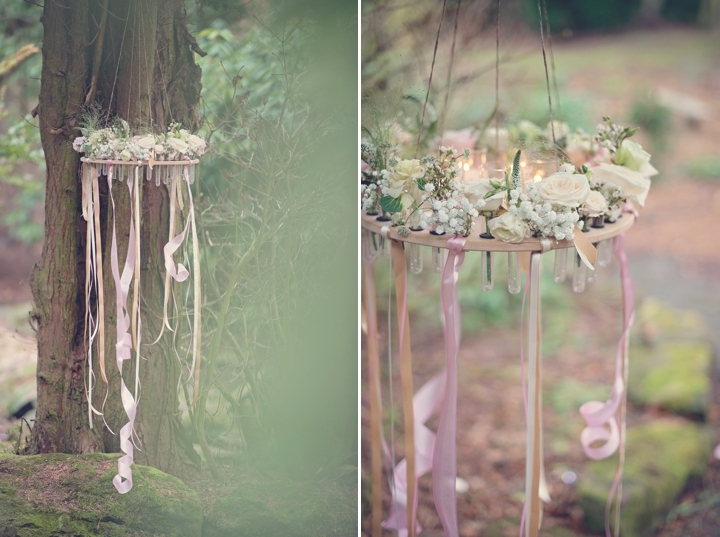 So today I am writing about a fantastic shoot that we had the absolute pleasure to be part of a couple of weeks ago. 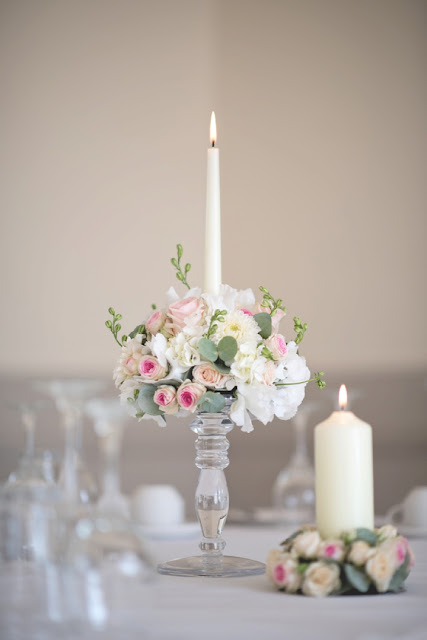 Not only did we think it was great to work on but the pictures were snapped up by Rock My Wedding blog and was published on Friday (follow the link if you want to have a read). 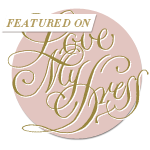 The shoot was put together by Ellie Grace Photography who is a self confessed Scrooge so wanted to put together something seasonal and stylish as opposed to the usual post box red and gold tinsel. Whilst Ellie was talking to her friend and make-up artist Julia Jeckell the word Nordic just seemed to slip out so it just went from there. Ellie managed to get some really creative people involved to contribute to the day including our very own Queen T who was more that happy to lend a creative hand. Out of 20 pins on a Pinterest board, everyone turned up on the day and using their incredibly creative minds managed to pull together this wonderfully accurate themed shoot. The foliage on the top of the cake was almost identical to the illustrations on the invites, all the tones and colours and everything just went SO WELL! I guess this is exactly what happens when you give 3 creative talented people a mood board and they just do it. I suppose all that's is left to say is a massive thank you to Ellie for allowing us to be involved in such a great project and if you would like to look at more of her work please follow the link to her website. 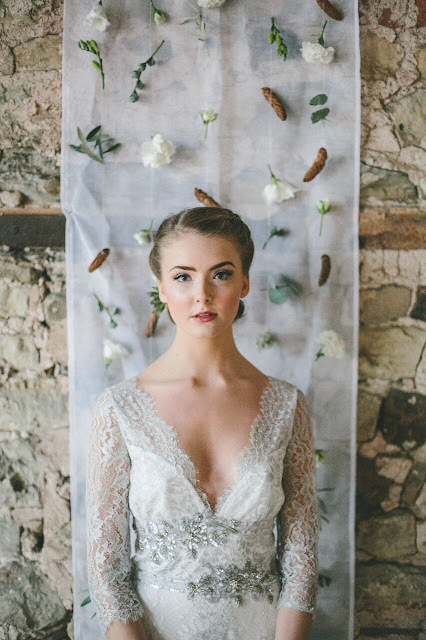 And finally a big shout out to Amanda Perry for the cake, Grace for her creative illustrations, Camp Katur for use of the barn and finally The White Room for letting us use the stunning Claire Pettibone dress. Now here are the pictures, grab a cuppa and enjoy people! 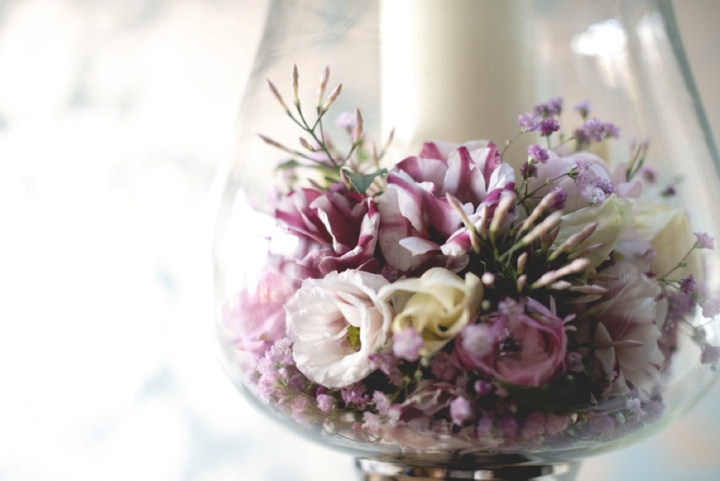 Luxe Wedding Flower Inspiration - Beautiful, Blowsy, Blooms. 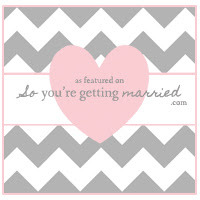 Today on the blog I am bringing you something a little different from the usual real weddings blogs I've been writing. 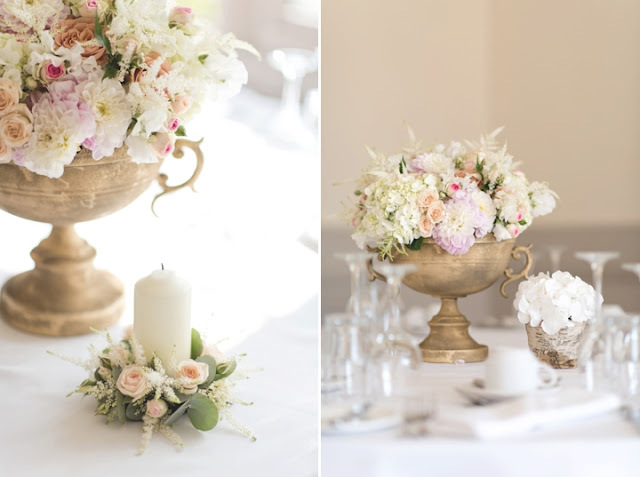 A month or so ago T (as the resident floral expert) wrote some fabulous content for Boho Wedding blog all about the 'Luxe' inspiration, what it is and how to use it in your own wedding. 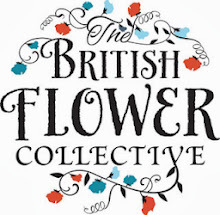 It's a bit of a follow on from the Autumn Luxe Flower Inspiration blog that T wrote for the site back in September. 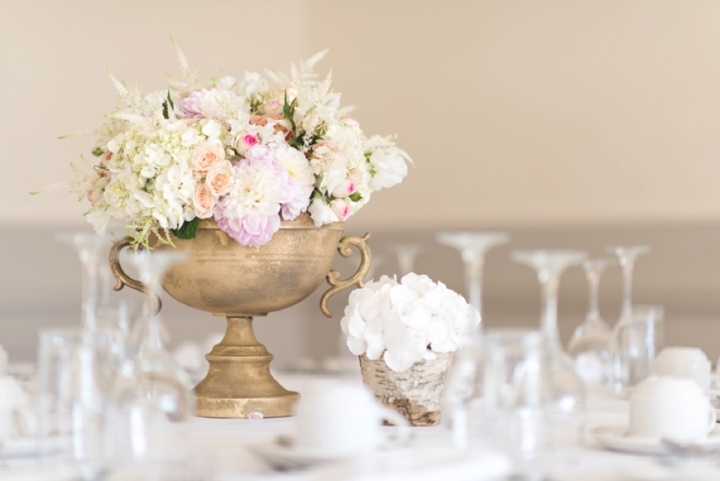 I'd like to introduce you to a trend which is taking the wedding industry by storm, in one word ... luxe. But what is the whole luxe thing I hear you cry and does it mean blowing my carefully planned budget? No, no, fear not. 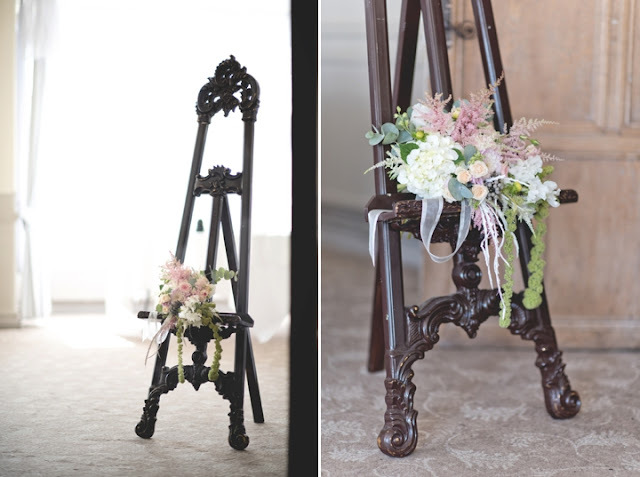 It's just that we're starting to move away from the vintage-inspired, make-do-and-mend, DIY philosophy towards a more luxurious, romantic look full of beautiful, blowsy blooms. Romance is back and it can be tailored to suit all manner of weddings for the classic, stylish, understated - through to the outdoor ceremony full of gorgeous tables and structures covered in seasonal pretty. 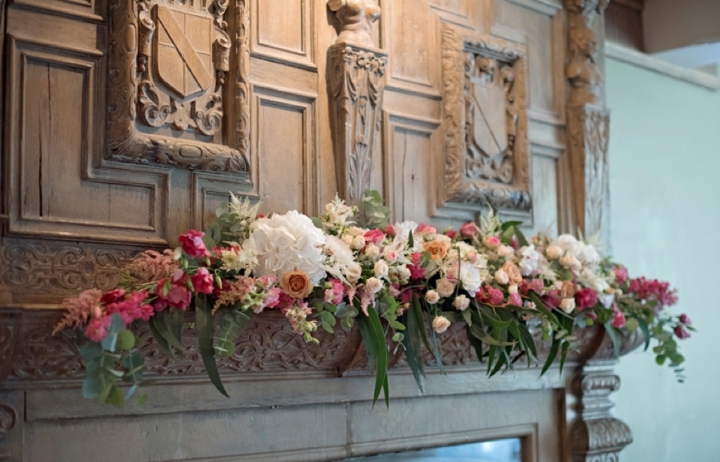 For venue decorations hanging flowers are just one of our fave ways to create luxe impact at your venue. 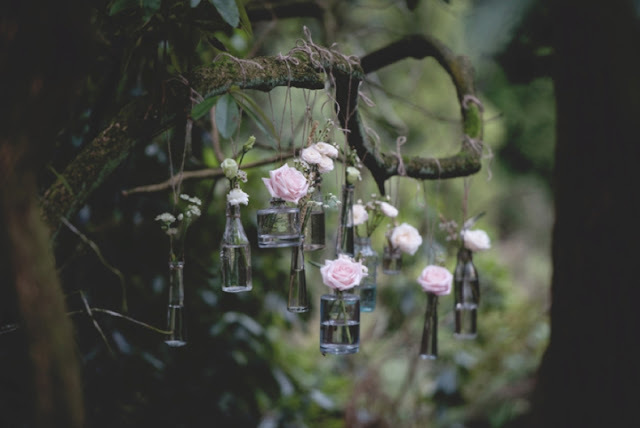 Their versatility means you can choose from a few baubles filled with flowers to hanging antique bottles - perfect for the budget - concious bride. 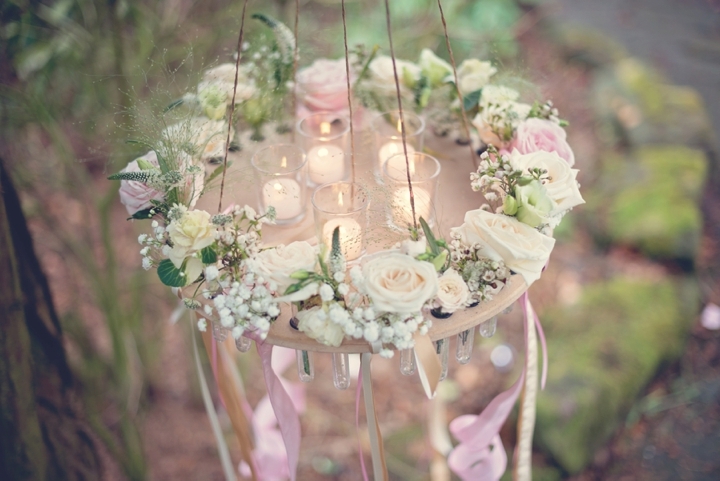 If you're looking for a statement piece, a sense of drama and lots of impact, then a series of floral chandeliers might just be perfect in your marquee - think blooms in your colour palette teamed with pretty coordinating ribbons and you'll be seriously embracing the luxe. 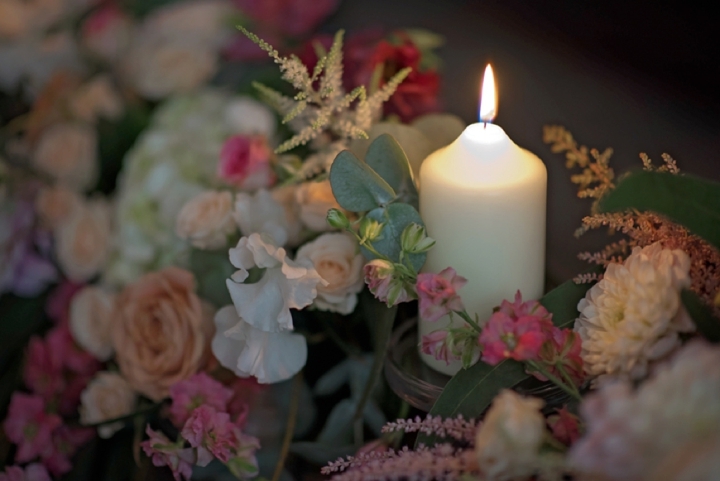 As you'll know from reading our Autumn blog, I'm all in favour of stretching your floral designs to help earn their keep and work hard for you, so think about decorating a feature fireplace or pretty window ledges in your ceremony room with a sumptuous display which can be easily moved to fill your top table with super scent and romantic candle light. 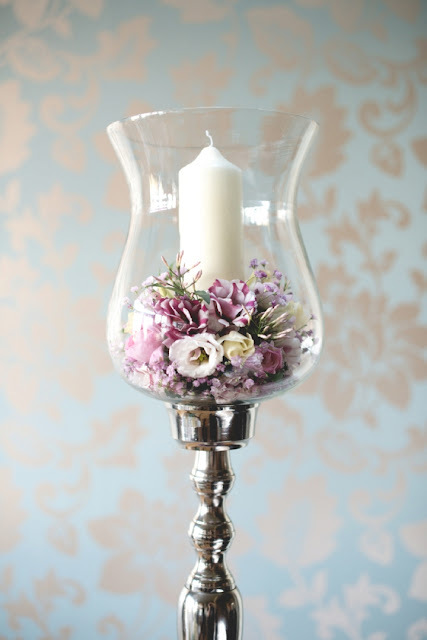 I often get asked by brides for ideas on how to dress a ceremony room - understandably you want it look amazing when your guests walk in, but don't want to spend a fortune on decorations which might only be appreciated for a short while. If you're happy to go for it, then why not decorate features like a staircase - just perfect for those photo opportunities! We've always championed seasonal flowers, designed in a very natural style and are continuing to do so next year. 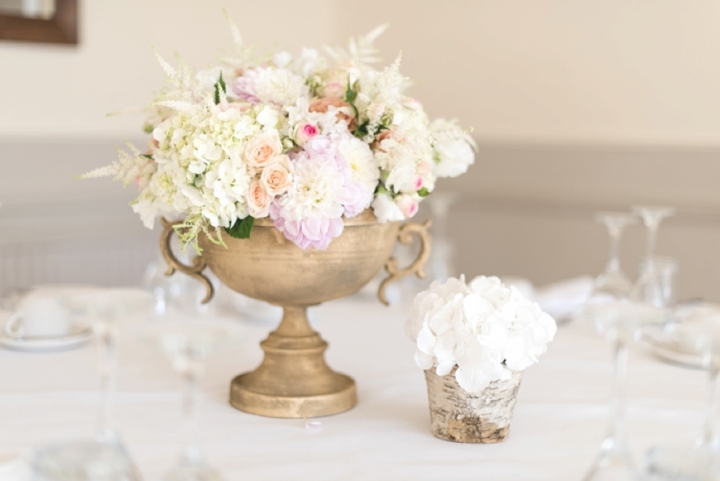 We're really starting to move away, however, from decorated jam jars and are looking at simple, stylish glass, copper vessels, rose gold urns, footed bowls, white china and much more. 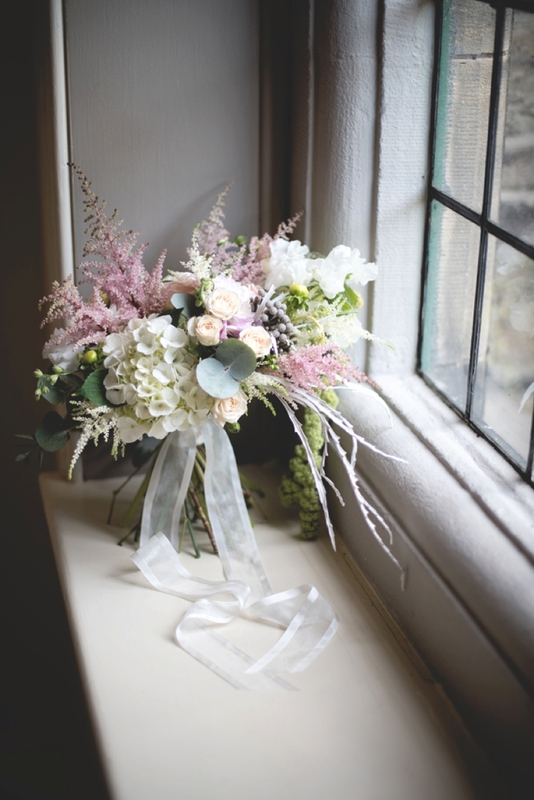 As ever, the shape of your bridal bouquet is very much dependent upon the silhouette of your gown and shame on any flowery person who doesn't discuss this with you! 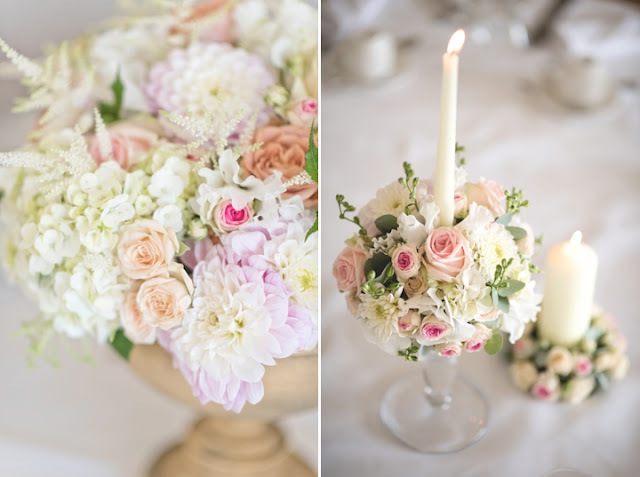 Whether you choose a sumptuous, cascading, waterfall design or a simple all round, posy-style design, think texture, more texture and yet more texture! We love all kinds if accessories and our grooms are happy with either focal flower or a sprig style designs, but one thing to be sure of is that your buttonholes contain elements of the flowers you've chosen in your bouquet. Luxe doesn't mean everything has to match exactly, it just means that your flowers should look like they come from the same 'family', so before you know it, everything will look effortlessly stylish! 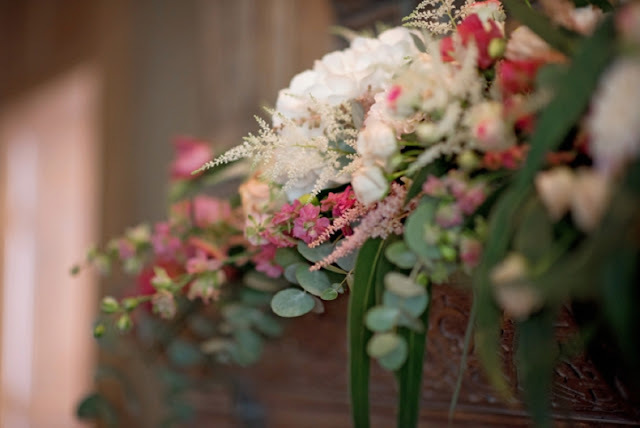 So, as always I hope this feature has helped show the wealth of blowsy blooms, tempting textures and stunning scented flowers which embrace the luxe movement. 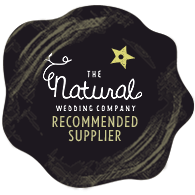 Massive thanks go to the uber talented and ridiculously lovely Sarah (or Brabbers as she's known by Team Campbell's!) 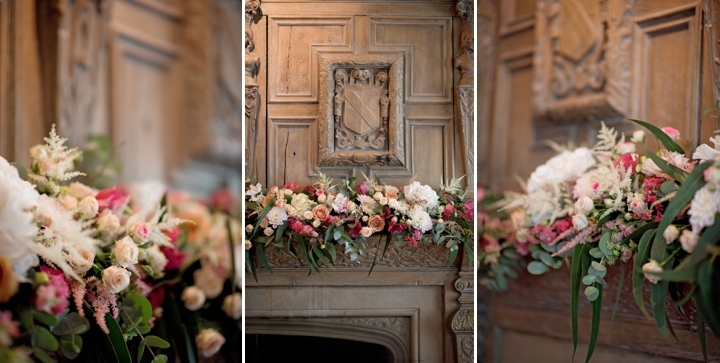 of Sarah Brabbin Photography for her time and patience in taking all these wonderful shots at the atmospheric Whirlowbrook Hall. So that's it from Queen T, I hope you have found it super inspirational.